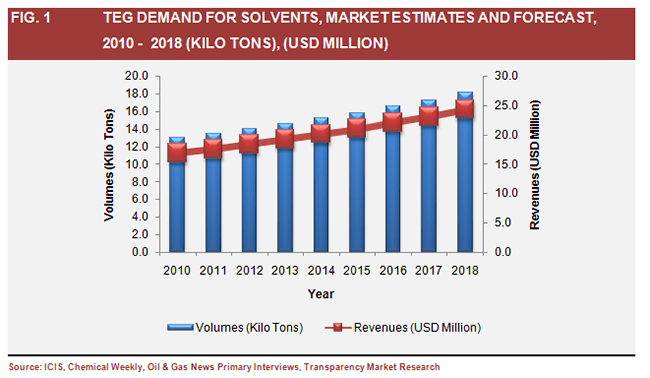 According to “Triethylene Glycol (TEG) Market - Global Industry Size, Market Share, Trends, Analysis And Forecast, 2012 - 2018”, a new report published by Transparency Market Research, the demand for global triethylene glycol (TEG) market ,totaling US$167.9 million in revenue in 2010, is anticipated to reach US$237.2 million by the end of 2018, growing at a CAGR of 4.7% during the forecast period from 2013 to 2018. In the year 2011, Asia Pacific dominated the global market for TEG, accounting for 66.2% of the global market share in terms of volume, followed by North America and Europe. Apart from being the largest market for TEG, Asia Pacific is also the fastest growing market. This report is designed by Transparency Market Research to present an in-depth analysis and market study of the demand and performance registered by TEG globally. The report segments the global market for TEG in terms of its applications and demand by geography. A detailed investigation on the global and regional drivers and market restraints are also included in the report apart from mentioning the challenges faced by the TEG market in the global scenario. A comprehensive assessment of the historical data, stakeholder strategies and growth opportunities is also included in the report. The increase in demand and expansion of the global market for TEG is driven by factors such as the growth of the global natural gas market and rising demand for plasticizers across global end use industries. The increasing application of TEG as a solvent has also significantly contributed to the growing demand in the global scenario. However, the global market for TEG is not free from bottlenecks. Volatile fluctuations in the prices of raw materials and stringent regulatory concerns associated with the production and use of TEG have adversely affected the growth of demand for TEG. The demand for natural gas is very high in countries across Asia. This has created an immense opportunity for global TEG manufacturers. Large application of TEG is required for natural gas dehydration.Therefore, a rise in demand for natural gas in Asia Pacific corresponds directly to the growth of the TEG market in the region. According to figures mentioned in the report, natural gas dehydration accounted for almost 58.6% of the global demand for TEG in 2011, makingit the biggest and fastest growing market,with growth at a CAGR of 4.8% predicted during the forecast period. The report also forecasts a stagnant phasefor other applications of TEG, which will only be able to capture smaller shares of themarket. The segment of the other applications for TEG includes solvents, plasticizers, polyurethane, humectants and polyester resins and many more. Gulf Council Cooperation (GCC) showed massive capacity additions, which is posing a major threat of oversupplyin the global TEG Market. The Kingdom of Saudi Arabia (KSA) emerged as the leading consumer of TEG in GCC. Saudi Arabia accounted for almost 63.4% of the overall demand for TEG generated in GCC in 2011. Dow Chemical (U.S.), SABIC (KSA), Honam Petrochemical (Korea), Shell (Netherlands), Sinopec (China), etc., are a few of the major participants leading the global market for TEG.